MANILA, Philippines - The Commissioner’s Cup has just wrapped-up and eight teams moved up to the Playoffs with high spirits. 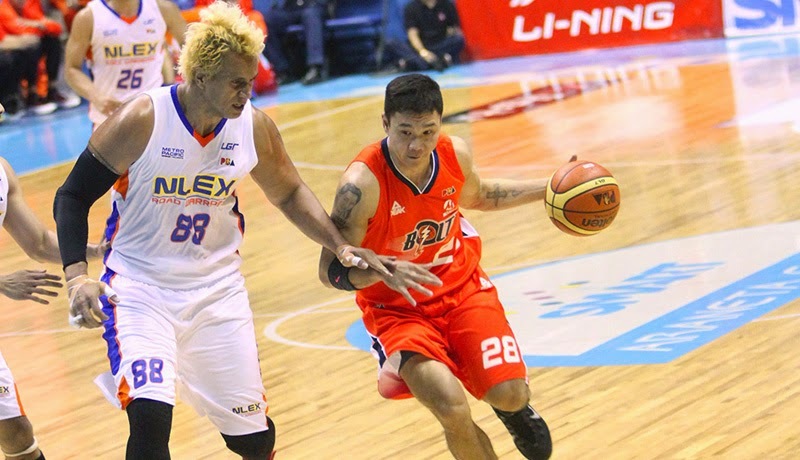 The 42-year old Asi Taulava and his co-Road Warriors played Gary David and the rest of the Meralco Bolts for the first playoff match of the Commisioner’s Cup where the energetic Bolts electrocuted NLEX 97-82 and took game one of their best-of-three duel on Thursday, March 27 at the Smart Araneta Coliseum in Cubao, Quezon City. During the pre-game interview, NLEX Road Warriors Head Coach Boyet Fernandez revealed that they must contain the very athletic and Best Import Candidate Meralco Bolts import, Josh Davis especially his offensive rebounding and slashing in order to take game one. Future Hall of Famer Coach Fernandez was successful in containing the lanky Davis in the opening minutes of the game but he momentarily forgot that the Meralco locals can step-up and explode anytime. Gary David and Reynel Hugnatan made the Road Warriors pay for their very lax defense on them, surging for 11-2 run with almost 9 minutes remaining in the first quarter and prompted Coach Fernandez to re-call and re-group his squad. With the Bolts playing in high voltage, Fil-Am Jarred Dillinger gave Coach Norman Black a scare when ex-LA Clipper and NLEX back-up Al Thornton drove to the basket and fell hard right on Dillinger’s left knee. Jarred was immediately brought out of the court and replaced by Sean Anthony for further medical attention. He was later diagnosed by the team therapist with a sprained knee. The “Dare Devil” seemed alright and went back on the bench after the half time break but never got back into action to avoid over-stressing his knee. While the Meralco locals were consistently playing and scoring well without relying much on their prized import, Al Thornton on the other hand almost single-handedly carried his team in the early half of the game and made a 9-0 scoring run that hinted Coach Black to bring Josh Davis back on the floor to stop Thornton and NLEX’s attacks. NBA Veteran Thornton, continued to be aggressive in the driving lane in the second half and earned most of his points from the foul line with an almost unblemished 17-20 free throw shooting and listed a total of 23 points and 11 boards. Jonas Villanueva and Mac Mac Cardona helped the relentless Thornton to close the gap within 6, 45-51 with 6 minutes remaining in the third period. But the “Cool Cat” Mike Cortez and Mark Macapagal played as Bolts’ fire extinguishers with their 3 point shooting skills to bring back Meralco’s double-digit lead 67-57 in the final minute of the penultimate quarter. Mark Macapagal continued to wax hot by sinking two more contested treys to open the final salvo of the first playoff match. Macapagal tallied 22 points with 5-10, 50% 3-point shooting and eventually became the Best Player of the game. Coach Boyet Fernandez was able to neutralize Josh Davis in the first half. But the Kawhai Leonard look-alike Meralco reinforcement and coincidently played for San Antonio Spurs made his way and broke NLEX’s glue-tight defense on him to record a passable 16 markers and outstanding 21 rebounds in the entire ball game. With this win, Coach Norman Black is just a win away to advance in the semi-finals.